The DC War Memorial Controversy & the Centennial of World War I - The Association of the Oldest Inhabitants of D.C. 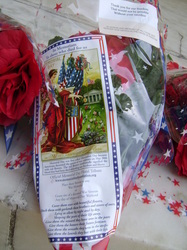 Since AOI's 2010 Memorial Day event recognizing the 90th anniversary of the District of Columbia's World War I 16th Street Tree Memorial, more controversy has arisen regarding congressional bills calling for re-designating the District's War Memorial (in Ash Grove on Ohio Drive) as a National World War I Memorial. 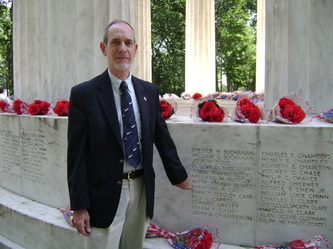 With the encouragement of AOI member Joe Grano, the AOI has taken a strong stance against this usurpation of our War Memorial and have communicated our displeasure to Congresswoman Eleanor Holmes Norton who has, in turn, introduced her own House Resolution telling Sen. Rockefeller (WV) and Cong. Ted Poe (TX) to keep their hands off the D.C. War Memorial. Since this issue has come to light, the AOI has strongly encouraged Cong. Norton and District Officials to take a firm stance against these initiatives and we have corresponded with the National Capital Planning Commission, the Commission on Fine Arts and testified before the National Capital Memorial Advisory Commission and the House Committee on Natural Resources. In addition to opposing the re-designation of the DC War Memorial as a National World War I Memorial, the AOI has called for recognizing Pershing Park and the American Expeditionary Forces Memorial as a National World War I Memorial. Below are links to all of AOI's correspondence regarding this most important issue. We will add more as events unfold. AOI's Published Letter to the Editor - Washington Post, Dec. 4, 2011, "Time Is Running Out!" What? Pershing Park IS on the Mall! 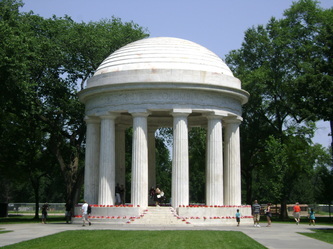 We highly suggest that if you care about the District maintaining its War Memorial (dedicated in 1931), are concerned about adding more memorials to the National Mall (currently prohibited by Congress) but believe that the existing Pershing Park would be a fitting tribute as a National World War I Memorial, you will want to read the above correspondence. Did you know there is another DC War Memorial commemorating District residents who gave their lives in service to their country? Click here to be taken to the District of Columbia 16th Street Memorial and the AOI's efforts to publicize its plight and call for its restoring in time for its 2020 centennial. A Never Ending Story: Congress appears to have refocused their efforts on establishing a WWI Centennial Commission, re-designating the National World War I Museum in Kansas City a National Memorial and explore alternatives for a new National World War I Memorial in Washington, D.C.
Read the Washington Times' Thomas Howell, Jr.'s article on this change of approach and on the District of Columbia City Council's Sense of the Council Resolution on Pershing Park. 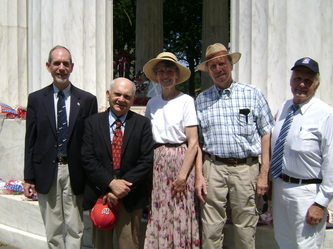 On Tuesday, September 11, 2012, a hearing was held by the House Committee on Natural Resources to hear testimony on recently proposed changes to the Poe bill which would establish a National World War I Memorial in what is now Constitution Gardens which is located just north of the Reflecting Pool on the S.W. corner of Constitution Avenue and 17th Street. Read Tom Howell's account of the up-coming hearing in the Washington Times on 9/10/12 and The Huffington Post's Andrea Stone's coverage from 9/11/12. The National Park Service's National Capital Regional Director Stephen Whitesell also supports Pershing Park as an appropriate memorial to the centennial of World War I in his testimony and says: "A national memorial to World War I veterans has already been established in Washington, D.C., near the White House, in Pershing Park, on Pennsylvania Avenue between 14th and 15th Streets... Rather than duplicate this memorial by establishing a new memorial to World War I, the Department would encourage enhancement of the World War I Veterans Memorial in Pershing Park." Read the complete text of HR 6364, Congressman Poe's revised legislation to establish a World War I Commission and new memorial on the National Mall. HR6364. Note Sect. 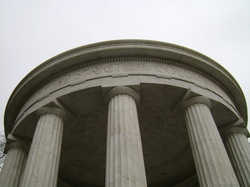 10, paragraph (d) prohibits encroachment on the District of Columbia War Memorial. The Washington Post's John Kelly continues his coverage of the DC War Memorial expressing his enthusiasm for additional interpretive elements at the Pershing Memorial... perhaps a "...WWI era tank and biplane! That would be so cool!" The District of Columbia War Memorial photographed by Bill O'Leary is the featured photo for November 2013 in the Post's 2013 calendar distributed with their supplements on 11/11/2012. Veterans' Day 2012 -- "The Right Way to Remember the Great War" in the Washington Post's "Local Opinions" by Bill Brown (additional related photos appear in the story to the right). House Committee on Natural Resources mark-up of HR 6364 appears to move Cong. Poe's forward in the House. Read the Washington Times' Tom Howell's account in this December 5th article AND read the amended section of the legislation. 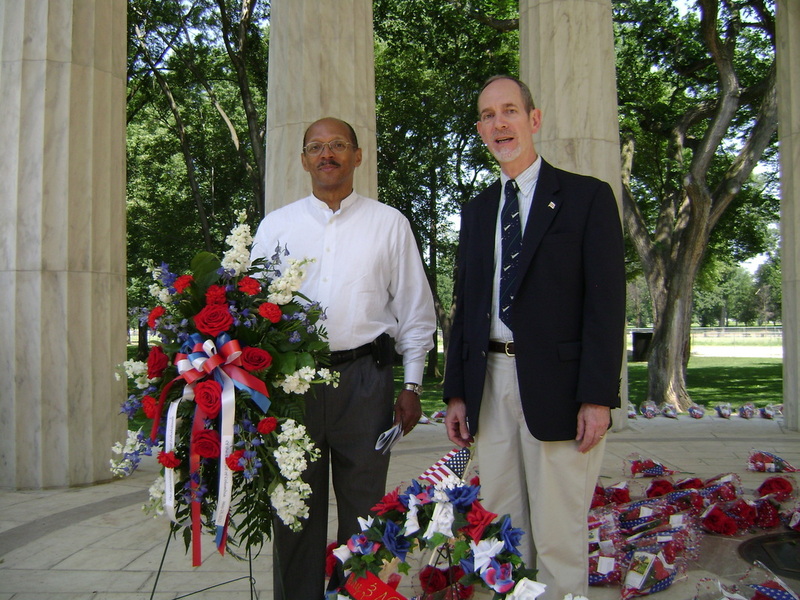 On April 28, 2014, Delegate Eleanor Holmes Norton, Congressman Cleaver and other Congressional Representatives introduced HR 4489 that would re-dedicate the Pershing Memorial as the National World War I Memorial in the District of Columbia in time for the Nov. 11, 2018 centennial of Armistice Day and the end of World War I. Read the text of the legislation here. 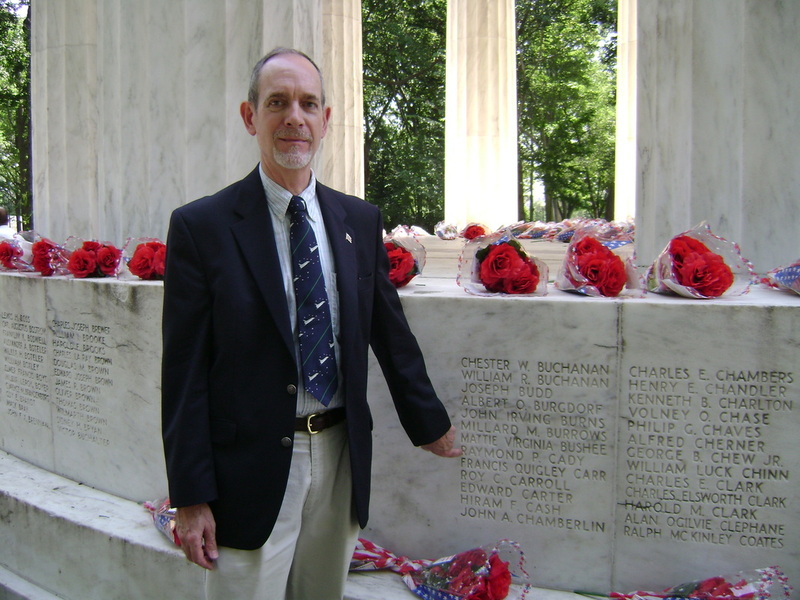 The Washington Times' Thomas Howell, Jr. continues his coverage of the DC War Memorial controversy and AOI's quest -- inspired by departed member Joseph Grano -- to focus attention and resources to revitalize and re-dedicate the Pershing Memorial. Read his article here for more details and history of this initiative. The National Park Service has installed a new, interpretive wayside at the DC War Memorial in Ash Grove. Click here to read AOI's 'thank you' letter to NPS Director Jon Jarvis, and view a slide show of the new wayside in the right column of this page. On Sunday, August 10, 2014, Philip Kennicott of the The Washington Post wrote extensively about the various memorials in the District and vicinity dedicated to World War I. Read his piece here. Congress has passed the 2015 Defense Appropriation Act that includes redesiginating Pershing Park as a nation memorial to World War I and puts to rest the issue of encroachment on DC's own War Memorial. You can read an excerpt of the 1600+ page bill here. 2015 Defense Appropriation Act excerpt. ​To remain current with the developments at Pershing Park, the best way to do so is to check-in periodically at the National Park Service's Planning, Environment and Public Comment (PEPC) page. ​Read the Cultural Landscape Foundation's article about Pershing Park's Determination of Eligibility status. ​We also invite you to read AOI's response to the 2nd NEPA Section 106 meeting held on Wed., Sept. 21, 2016 which addresses design revisions for the World War I Memorial and Pershing Park. Now, in early 2017, the design team for the World War I Centennial Commission has submitted more revisions for Pershing Park which we continue to object to... Congress' mandate was to "enhance" the existing Pershing Park; however, these alternative designs virtually destroy/render unrecognizable the award-winning Frieberg/Ohme-van Sweden design of the existing park. Read our comment of 2/16/2017 to the US Commission on Fine Arts below. We will be filing a similar letter to the National Capital Planning Commission for the next meeting to be held on Thursday, March 2, 2017. As AOI members arrived to prepare for the program, we were pleasantly surprised to find that 499 bouquets of red roses had been placed around the memorial by the Memorial Day Foundation in N.Y. As we set up for our brief presentation, including the reading of the D.C. City Council's Ceremonial Resolution we were impressed that a Scottish-themed honor guard arrived to lay their own wreath at the memorial. As 11 am approached more and more tourists arrived and a National Park Service volunteer appeared to provide information and pass out NPS's DC WWI Memorial brochures. Three of DC's four major television stations spent considerable time interviewing a number of us. The reading of the DC Council Resolution followed by remarks by historian C.R. Gibbs were greeted with applause from the audience. We hope that today's event and AOI's informal celebration helped to continue to promote the city's desire to maintain its (WWI) War Memorial as our own and help focus attention on Pershing Park as an appropriate alternative for a National World War I Memorial. Wouldn't $10,000,000 Go A Lot Further to Enhance Pershing Park Than for a New Work in Constitution Gardens? Congressman Poe's new bill, H.R. 6364, would authorize the [National] World War I Memorial Foundation to add elements in the vicinity of the existing Constitution Gardens (not to exceed 1.5 acres) and not cost more than $10 million to commemorate World War I. Wouldn't the time and effort needed to proceed with this initiative, not to mention the $10mil., go a lot further to enhance the existing Pershing Memorial in time to celebrate the centennial of the Great Conflict? The funding could be used to add statuary to represent the other service branches, interpretive signage, a reproduction tank or biplane attraction and a modest visitors' center. In fact, why couldn't space on the ground floor of the John A. Wilson (District) Building be set aside as a volunteer-staffed National World War I Memorial Visitors' Center just as the Commerce Department houses the White House Visitors' Center? Time is running out as 2014 approaches and the centennial period of the Great War begins. Pershing Park's water feature with the Treasury Department in the background. A World War I Memorial in Oak Park, IL could serve as a model for additional elements. A view of Constitution Gardens suggests a commemorative work to WWI would be 'lost' in its vastness and somewhat 'off the beaten path' of visitors. Detail of current statue of Gen. Pershing and the detailed, engraved panels depicting American Expeditionary Forces campaigns. ...now, nearly two years later, as the centennial of World War I has commenced, attention has finally turned to recognize Pershing Park and the American Battle Monument Commission's memorial to General Pershing as a national World War I Memorial in Washington, D.C.
Congressional Delegate Eleanor Holmes Norton has co-sponsored legislation together with Congressman Cleaver and other Congressional Representatives and introduced HR 4489 that would re-dedicate the Pershing Memorial as the national World War I Memorial in time for the Nov. 11, 2018 centennial of Armistice Day and the end of World War I. Senator Claire McCaskill has introduced similar legislation in the U.S. Senate. Additionally, at its World War I Centennial Conference and Trade Fair (held Sat., June 14, 2014 at the offices of Jones-Day in Washington, D.C.), the U.S. World War One Centennial Commission listed among its Commemorative Programs and Events goals, "The Commission will ask Congress to authorize a national World War I Memorial at Pershing Park in Washington, D.C...."
The National Park Service has already weighed in recommending that the word 'national' not be a part of the title (as other memorials do not bear this moniker) and that a separate division/entity within the Park Service be established to oversee the park. Pershing Park is already under the auspices of the National Park Service but recognizing it as a distinct entity allows for certain administrative advantages. Now, with the DC War Memorial controversy behind us and most parties seemingly focused on Pershing Park we can re-focus our energy on promoting commemorative programs and service band performances at the DC War Memorial and contribute in various ways to support and promote the redesign, re-dedication and promotion of a new national World War I Memorial at Pershing Park in Washington, D.C.
For more information about the U.S. World War One Centennial Commission, click on this link. 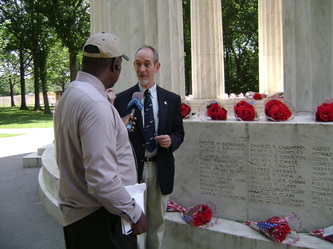 View Mark Levitch on the CBS Evening News as he discusses the threats to local memorials to World War I. Memorial Day weekend 2015 -- The design competition for a re-designed Pershing Park as the World War I Memorial progresses. Read Michael Ruane's account in the Washington Post. Unveil the new sculpture(s)/displays and commemorate the centennial of the end of the World War at the newly designated, re-envisioned Pershing World War I Memorial in Washington, D.C.
To read about the AOI's 90th anniversary recognition of the District of Columbia's 16th Street World War I Tree Memorial, click here. 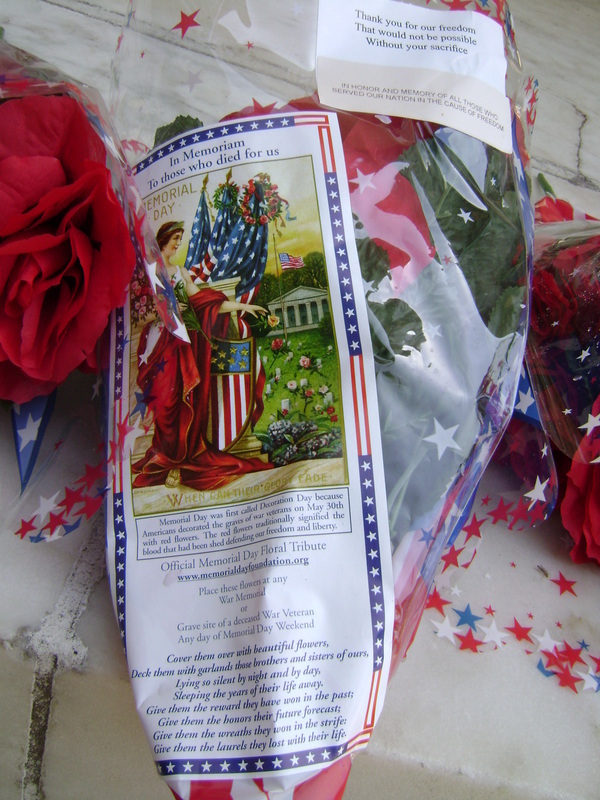 Also, See "Your Ancestors in the AOI" under the "About Us" tab to see if your ancestor is among those D.C. residents memorialized on both the DC War Memorial or the 16th Street Tree Memorial. 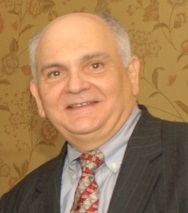 On November 24, 2013, D.C. preservation activist and long-time AOI member Joseph N. Grano passed away after a brief illness. 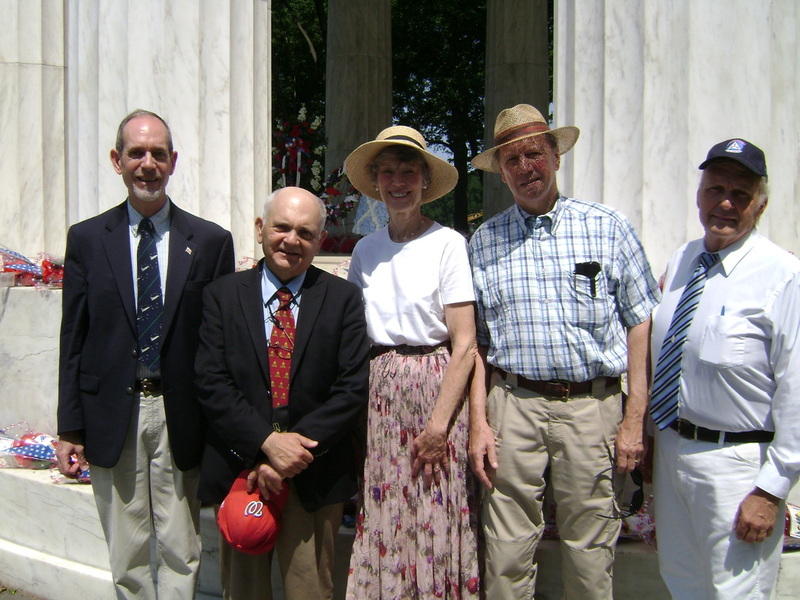 As a professional tour guide here in the District (among other hats he wore) Joe was often asked by his young charges and had difficulty reconciling the disconnect between the District of Columbia War Memorial (on Independence Avenue in Ash Grove across from the Martin Luther King, Jr. Memorial), other national war memorials on the National Mall and the several other memorials to World War I including the often overlooked memorial to General John G. Pershing on Pennsylvania Avenue between 14th and 15th Streets, N.W., just one block from the White House. At Joe's urging, the AOI of DC took on the tasks of calling attention to the plight of the DC War Memorial (since restored), efforts to nationalize it and re-name it a 'national' World War I Memorial and, instead, focus the attention of our elected leaders (both local and national), the news media, veterans organizations and the public on Pershing Park. As you can see from the chronology of initiatives and events documented on this page, a considerable amount of time and effort was dedicated to Joe's dream... had he only lived to witness the outcome. In a phone conversation that Joe had with AOI President Bill Brown a few weeks prior to his death (and at this point, Joe was just "under the weather") he was modestly down-playing the part he had played over the years calling to the attention of the AOI the "centennial" of many note-worthy events in D.C.: the centennial of the John A. Wilson (District) Building [the seat of DC government], the centennial of the District of Columbia 16th Street War Memorial, the centennial of the District's Building Height Act and, of course, the approaching centennial of World War I. 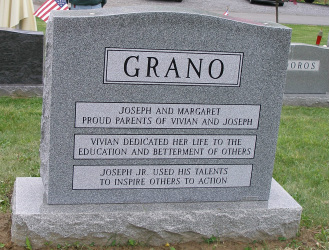 When Bill pointed out to Joe how much he had inspired others to action, Joe replied, "Well, perhaps that can be my epitaph..."
We will miss Joe Grano and his "inspiring others to action."